The Vassar College baseball team dropped the final two games of its Liberty League Conference series against the Clarkson University Golden Knights. 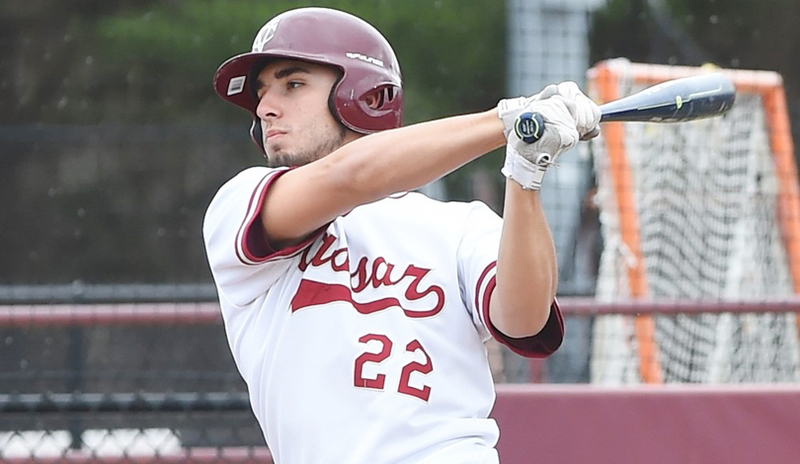 POUGHKEEPSIE – The Vassar College baseball team dropped the final two games of its Liberty League Conference series against the Clarkson University Golden Knights, 7-1 in game one and 11-8 in game two Saturday afternoon. At the beginning of the day, the Brewers played the final inning of Friday evening’s double header, falling 18-5 to the Golden Knights. The Brewers opened the game strong on the mound. Matt McGannon striking out two batters in the first inning. Vassar had valiant opportunities in the first four innings leaving runners on base, though Clarkson was first to capitalize scoring five runs in the bottom of the fourth inning. In their next at bat, Sam Brinster hit a double sending Brent Shimoda to third base. A sacrifice fly from Matt Schwartz opened the land for Shimoda to cross home plate and earn Vassar’s only run of the game. The Golden Knights responded by scoring an additional two runs to close out the inning. Down by six, the Brewers looked to gain some advantage in the top of the fifth inning, with 1 hit however the inning ended with the runner left on base. After five innings, Joe Conti stepped to the mound for the Brewers. Conti struck out two batters on 23 pitches, yet Clarkson connected with two more runs. McGannon is now 2-2 on the season. Cameron Skudin, Bryan Rubin, Shimoda, Brinster, and Schwartz all notched one hit with three at-bats. Jesse Mullham earned Vassar’s sole RBI. Daniel Bonfiglio led off the game with a solid hit down the right base line. Next at bat, Martino swung for the fences giving Vassar a quick 2-0 lead. Shimoda moved to the designator spot and hit a double before Brinster hit another double, forcing Shimoda. Hit by the pitcher, Evan Trausch advanced to first and loading the bases the Brewers. Though, Vassar ended the inning with all three runners left on base. Clarkson also started the game strong scoring three runs in the bottom of the first inning and taking the lead. Jason Salerno and Billy Mathiesen entered the game for the Brewers in the bottom of the second. Despite Mathiesen pitching well, Clarkson edged out another run. The Golden Knights scored two more runs in the bottom of the third inning. In the top of the fourth, with two outs and Taylor Smach and Schwartz on base, Bonfiglio walked to load the bases. Martino stepped to the plate, and scored his second homerun, to tie the game. Rubin enters the game for the Brewers in the bottom of the fourth and striked out two batters. The Golden Knights took back the lead in the bottom of the sixth inning, scoring three runs. The Golden Eagles added two more runs in the bottom of the seventh inning. With just one out at the top of the eighth, Pinataro got a hit to first before Salerno struck a double out to right field securing a RBI. Salerno at second, and Martino at first, Shimoda swung for a double sending Salerno across home plate. With the set of losses, the Brewers move to a record of 8-11 and 3-5 in conference.